First of all, if you call yourself a WUGner you owe it to yourself (and Yamakan and the people of Tohoku and Japan etc etc) to visit the region. Sendai is probably the easiest location to tour, and being a major transit hub of the area you probably have to go through it to reach the rest of the Miyagi Prefecture anyway. Not to mention is definitely a worthwhile place to see. It’s sufficiently mix of actual urbana and good-enough tourist attractions, and feels just different enough from Tokyo. The key thing about touring Sendai as a WUGner is the official WUG tour page. (Hit the recommend course link (the middle tab) to see what I’m referring to in the post below.) It’s mobile optimized so load that up on your phone or tablet as you go. The Google Maps coordinates are accurate, as I’ve tested at least half of them. Just note that when you use Maps with a geo coordinate, it might not route you to the correct side of a block. Anyway, give it a read first. 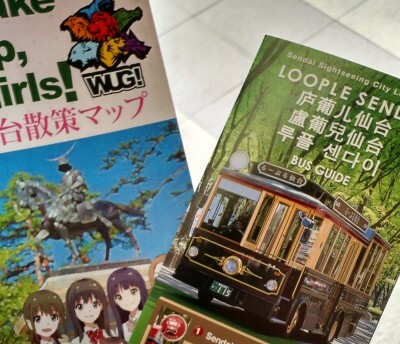 The issue I have with the official WUG tour is that it’s optimized for anime pilgrims, not oversea tourists who may have never set foot in Sendai, or even know much about it. It’s probably too high level in the sense that there are some basic Sendai things that I care more about than, say, the three shops in the shopping district near the station that got repped by the anime. In fact, one of the key WUG locations isn’t even in the WUG tour but is very iconic in all the WUG promos: the Aoba Castle. Presumably if you ever visit Sendai, that’s a major attraction, and you might know about it just from looking at this promo image. For someone who is day-tripping Sendai like I was, there’s no way to hit everything, although the recommended WUG tour probably will take about most of a full day, so that is always an option. For my own first trip, and a day trip, to Sendai City, I prefer a mix though. Sentabi.jp is the Sendai Tourism board site that recommends some itineraries for travelers touring the region. Thanks to all that info (and in EN), it’s easy to take the very basic “course” they offer and graft that into the WUG tour. So basically when I got into Sendai station, I took the Loople and hit up the Date Masamune stops. What you might need to know about Mr. Date is in the first two sentences of his wiki article. Plus, well, get your guns on. At Sendai Station, visit the info booth and you can pick up the WUG tour pamphlet in case you don’t have a smartphone or something. They make good souvenirs too. The Loople is a municipal tour bus that runs only one way, and stops at several major sites on the outskirts of the city, so its use as a transport is limited even if it zig zags across the two major rivers running through Sendai and gives you good views. Still, it gives good value if you want to go up to the castle or hit up the Date sites. You can even get a discount at some locations if you purchase the one-day pass (which I did to make life easier). After hitting up the 1-3 Date clan sites, you can keep riding the bus and stop at Jozenji-door/City Hall (stop 14). 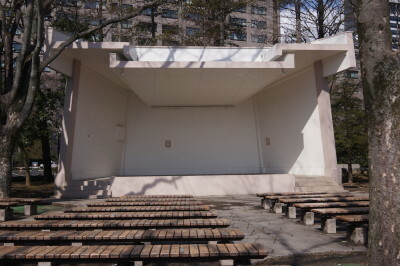 The live stage at the end of episode 1/movie (#8 on the WUG tour) is a few minutes walk from the bus stop, just around and across the block. From there, I walked to Gyoza no Tenpari for a late lunch. I was starving for sure, having a light breakfast before catching the 8:02 Hayabusa from Ueno. Thankfully being hungry is what you need to eat at a greasy Gyoza/Ramen place. Speaking of which, to build an itinerary you will also want to time yourself. The Date Mausoleum is about 45 minutes (some hill climbing required), and the Aoba Castle another 45 depending if you spend much time shopping or not. Give another 10 minutes for waiting on the Loople for each site, and 10 minutes of travel in between, you can figure out when you want to hit up lunch. I skipped the Osaki Hachimangu shrine because I was getting hungry and wanted to conserve energy for a potentially long day (more stairs there). However if you do all 3 Date sites before hitting the WUG part of the tour you can overall do more in a day thanks to the way Loople runs. Also depending on how you start your day, you can possibly rearrange which part of the WUG tour to hit first. I started from Kotodai Park because it was probably the closest location from a Loople stop. If you feel hungry earlier, you can do the WUG part first by taking the subway, then come back to the rest later in the afternoon as well. Just note that the Loople stops at 6pm-ish. From the park, I walked for about 10 minutes to Gyoza no Tenpari (#7). 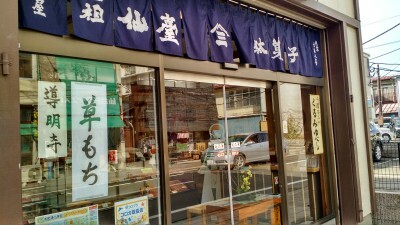 Gyoza no Tenpari is a pretty small ramen shop, so don’t bring a crowd and bring your competitive eating skills instead. Also, make sure you check the store hours. This place is super homey, and Obaachan closes between lunch and dinner. It’s about another 10-15 minutes walk to hit up the other to locations on the WUG tour, or back on the Loople, from Gyoza no Tenpari. 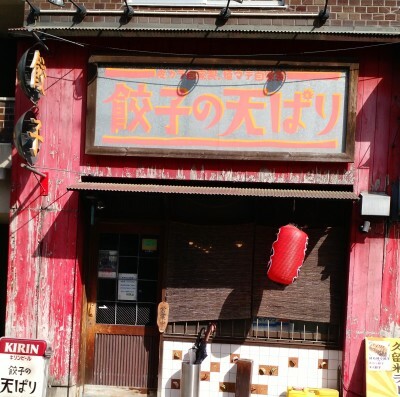 I walked to Kumagaya (#5) next, which is a somewhat famous okashiya (see: Airi’s house from the anime). On the way you can also see #6. Kumagaya is a must-visit, not because of the high quality snacks and stuff you can bring home, but it sells decent WUG hard candies. The store front is also quaint and kind of appropriate. 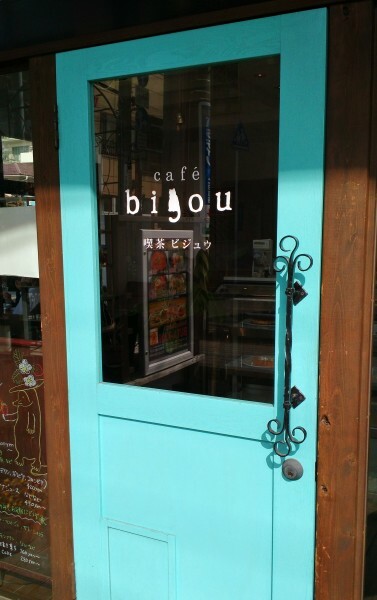 From Kumagaya, it’s 1 block away from Bijou (#3), which is the cafe WUGs visited a few times in the anime. It is also the store with the most WUGner visits, at least according to the communication logs. Both Bijou and Kumagaya have notebooks for WUGners to leave notes on, and as of my visit there were already 7 volumes of it at Bijou and only 1 or 2? 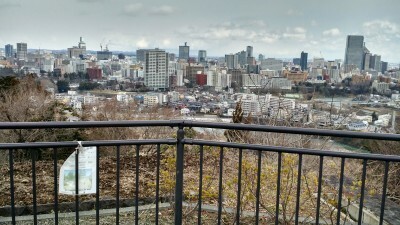 at Kumagaya. Oh, you will also walk past #4 which is near Bijou. Bijou is a normal cafe, so it’s a good spot to sit and rest for a while. It especially was nice after all the grease I ate at the ramen place, and could freshen up with coffee. Food-wise, I recommend either the liege waffle or the Pfannkuchen? I’m not sure what it is, but it’s like a crepe but thicker. It’s all pretty delicious, if albeit pricy. Bijou is also big enough for small groups, assuming it’s not overrun by housewives and students. That’s one thing I found out about Sendai, which is unless you are eating Chinese food (or similar) it’s probably not that cheap within the city proper. What I did at Bijou was not just rest my feet and help my body digest, but I filled out some post cards that I got at the Aoba Castle and then mailed it out after I was done at Bijou. There’s a post office one block from Bijou, and they close at 5pm. I was pretty tired by that point. Options were either take the Sendai city subway to WUG tour #2 spot, or get back on the Loople to go back to the station (or around again to see the other spots on the Loople line. I decided neither and go back to the JR station (by subway, since it’s much faster with less wait time, albeit an extra 200 yen) so I can visit Sendai’s main Animate store. WUGners probably should visit Sendai Animate (and Gamers, which is just up a floor form Animate), which is located inside the E-Beans building, towards the northwest end of the sky bridge coming from Sendai Station. You can enter the building on the third floor directly from the walkway. Animate is on the 7th floor (and takes up the whole floor). 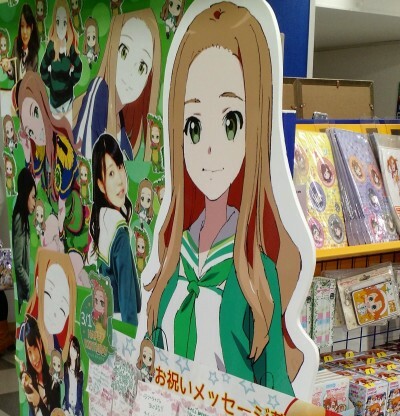 The corridor near the restroom is where you will find all the WUG stuff. One level up is Gamers, and you can see the WUG standees by the up escalator going to the 8th floor, plus a section of WUG goods on the opposite wall. There are also some collab t-shirt being sold, or were? There’s all sorts of collab going on with WUG at Sendai, and I didn’t compile a list beforehand. It probably will take some real-time sleuthing anyway, a service I have no access to or can provide. If you have any input or questions please let me know. 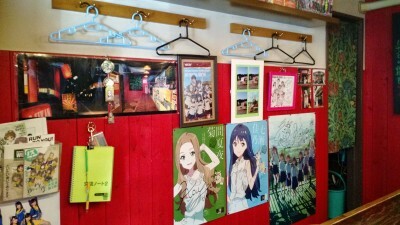 I would like also to be able to identify the key locations to buy WUG goods in Sendai. PS. Luvya is the basis for the “maid” cafe in the WUG anime. In reality it is an idol cafe, with an idol group called Luvya. I was planning to hit it but it opens only from 6pm. Note that there is a cover charge by the hour and typically the first performance doesn’t start until 7:30pm. Definitely somewhere you go after dinner or if you are staying in the city. This entry was posted on Thursday, March 12th, 2015 at 10:06 pm and is filed under Modern Visual Culture, Wake Up Girls!. You can follow any responses to this entry through the RSS 2.0 feed. Sendai was my first ever anime pilgrimage last year, and this so brings back those memories. I never went to as many places as you have (especially the food ones, I’m not a food person), although I did check out the Osaki Hachimangu shrine. Really, the Loople is all I needed for most any stop. I liked the laid-back atmosphere of the whole city, and do notice the post-tsunami effects in the riversides and rebuilding efforts scattered all over. All-in-all a recommended thing for WUGners I guess. Maybe the movie will give this a little more push, although admittedly there weren’t many tourists when I went there. Kinda lonely and quiet, but kinda my preference too.